The standard over head smash in tennis has two broad steps. Please refer to Nicole Vaidišová’s smash photo sequence as you go trough the steps. The first step is to turn your body sideways to the net. While turning your body sideways get your upper body very close to the trophy pose of the server – racket and hitting arm in an L with racket pointed up. 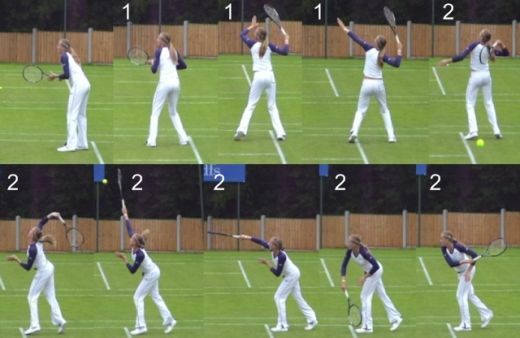 Use the non hitting arm to point at the tennis ball. The non hitting arm does not have to be straight. It points at the tennis ball to help track the ball to the racket. Make adjustments with your feet to move forward to get under the ball. The mechanics of the swing is identical to how you would hit the ball on a serve – racket drops down behind your back while the other arm drops down, then you swing up pointing the edge of the racket and pronate to make contact with the ball when your hitting arm is fully extended and the ball is in front of your body. Follow through to the other side of your body. Here is Maria Kirilenko hitting an scissor-kick overhead. You hit a scissor-kick overhead when your opponent has hit a particularly good lob and you have to move back to hit the overhead. The mechanics of how you hit the ball is identical to a normal overhead. What is different is the footwork. You step back with your back foot (right leg for right handed players), then bring front foot back and in front to cross your back foot, then stop back again with your back foot. Repeat this scissor like footwork as many times as you need to go back to the ball. This footwork pattern allows you to move back much faster than if you moved back sideways or shuffled back. When you get under the ball, plant your back foot, jump off that foot (the racket should start to go down), hit the smash in the air and land on your front foot. This footwork pattern during the scissor over head smash in tennis allows you to rotate your body towards the net to swing correctly.